The holidays are a great time to plan a fundraiser that will help others, provide a needed service or produce a product people already plan to buy. If you can meet a need and raise money for your nonprofit, it’s a success! Plan early and prepare to market your fundraiser as soon as Thanksgiving is over, if not before. Ornaments - Sell ornaments with your school or nonprofit’s logo or another meaningful symbol. Work with a vendor well ahead of the holiday season to design the decorations and offer at least two different styles. Christmas and Holiday Wreaths - Many people buy wreaths over the holidays, so plan to market yours before Thanksgiving. As well as your traditional fir wreaths, consider selling boxwood wreaths — both round and square. You could offer a discount for pre-orders and ask people to sign up ahead of time. Also, consider making wreaths out of craft materials to sell. Purchase items at your local crafts store, and then customize them for Christmas, Hanukkah, Kwanzaa and even Thanksgiving. Sell Holiday Flowers - Poinsettias are a popular Christmas fundraiser, and these festive flowers are inexpensive and hardy. To change it up, consider selling potted amaryllis. They have beautiful red blooms but also come in red and white and other shades. People love to give and receive flowers they can use for weeks. Market to businesses and individuals well ahead of December. Customized Christmas Cards - If your school or nonprofit has a vast photo archive and creative talent, utilize that to sell personalized Christmas cards. Include a short note on the back of the card with your group’s mission. This raises awareness as well as funds. Gift Baskets - Sell holiday- or Christmas-themed baskets. They are excellent gifts for someone to give or enjoy themselves. Put a variety of items in them such as ornaments, spiced tea or coffee, sugar cookies, biscotti, yogurt pretzels, popcorn, mixed nuts, wine or holiday-themed mugs. You could make a variety of baskets and decorate them with pretty ribbon and evergreens. Genius Tip: Make it a raffle with these raffle basket themes and ideas. Custom Art - Have the advanced art class at your school paint small custom canvases to sell. They can focus on winter and holiday themes as well as other designs you think will sell based on your demographic. Custom Candles - Work with a candle company (local, if possible) to sell holiday scented candles as well as other favorite scents. These could have your logo on them or just plain glass. Package them decoratively, so they make easy gifts. Coffee/Tea - Work with a local roaster to sell coffee for your holiday fundraiser. A local roaster can even help you specialize the package to include your nonprofit’s logo or story. Spiced tea and other teas are also great holiday gifts. You can sell them in decorative jars or tins for Christmas, Hanukkah, Kwanzaa or New Year’s Day. Coffee Mugs - Consider selling high-quality coffee mugs with your logo, holiday-themed or another compelling design. These can be Tervis or Yeti style or ceramic mugs of various shapes and sizes. Bottomless Coffee - Work with your local coffee shop to make and sell a “bottomless” coffee mug as a fundraiser. People pay a set amount for a specialized cup that they can take into the coffee shop for limitless or a fixed amount of coffee per day. Tote Bags - The holiday season means lots of gifts to haul around town. An oversized tote bag is an excellent solution to getting from point A to point B while keeping it all together. These bags can be plain, holiday-themed or have your nonprofit’s logo on them. Bake Sale - Freshly baked items make excellent gifts for co-workers, babysitters, neighbors and anyone who helps your family throughout the year. Organize a bake sale with beautifully wrapped treats, so it is an easy gift to buy and give. Make sure to note ingredients and allergens on the back. Genius Tip: Check out these bake sale ideas for fundraising. Cookie Dough - You can sell cookie dough in a unique flavor or a basic sugar cookie that people can easily bake and decorate for holiday parties. Be sure to include a list of ingredients and allergens. Party Snacks - Sell popular snacks that are easy to serve at parties such as mixed nuts and flavored popcorn. Work with a business that sells holiday-themed tins. Custom Cookies - People love pretty decorated sugar cookies to eat or to give as gifts. Work with the baker to decide the different designs and an affordable price and amount. Take pre-orders if possible, so you know exactly how many cookies to purchase. These make great gifts and serve as an easy dessert to bring to a holiday party. Gingerbread House Kits - Making gingerbread houses is a storied pastime that many people enjoy — young and old. Sell kits to benefit your nonprofit or school, and take preorders if possible. Christmas Trees - Consider running a small Christmas tree lot on your church or school property. You can work with a local tree farm to get the trees, and proceeds will go to your nonprofit. Decide days and times that work for your team, and recruit people to run it. 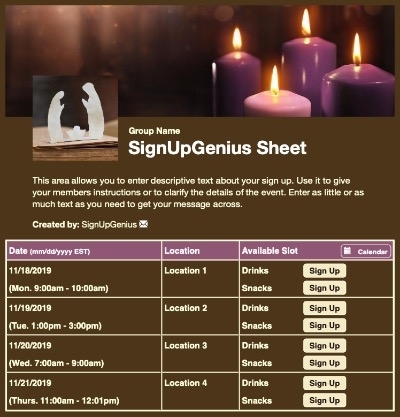 Genius Tip: Create a volunteer sign up to organize who is working when. Choir Concert or a Singing Christmas Tree - For schools and churches, utilize your choir to spread Christmas cheer. You can host an event, or people can sponsor your choir to sing at certain venues. Hospitals and nursing homes are a great start. You can also offer singing telegrams for purchase. Orchestra Concert - Utilize your school’s band or concert orchestra to host a Christmas concert. Make it a fancy event and offer appetizers and punch beforehand or desserts, coffee and hot cocoa after the show. Holiday Tea - Host a fancy tea party for the community or members of the school. Make it a special dress-up event where ticket sales benefit your organization. The event can be geared toward all ages, but younger kids can buy an additional ticket to bring their doll or teddy bear. Have tea and cookies available for the dolls and teddy bears to make it extra special! Host it at your venue or find a local coffee shop or nice hotel to partner with you. Father-Daughter Holiday Dance - Organize a father-daughter dance and all profits from ticket sales can benefit your nonprofit or school. This can be a dress-up event or a casual dance where you have someone teaching fun dance moves. You can also take photos at a photo booth for an extra fee to raise funds. Genius Tip: Try one of these father-daughter dance themes for your event. Holiday Fun Run - Host a fun run at your school or venue. People pay an entry fee to join with proceeds benefiting your nonprofit. Hand out jingle bells or headbands, and play fun music. Create T-shirts and offer additional giveaways. Recruit sponsors to help underwrite event costs or donate food and beverages. Dreidel Spin - Host a contest at your school to see who can get the dreidel to spin the longest. Each person pays an entry fee, and then the winner gets a prize. Proceeds benefit your nonprofit. Photos with Santa - Offer an alternative to the mall Santa Claus to raise money for your nonprofit. If you publicize early at a lower price than the mall Santa photos, many people will be happy to support a good cause. Find a venue with a fireplace and Christmas tree if possible, and if not, decorate your spot and have activities for the children while they are waiting. Recruit plenty of volunteer elves to make sure it runs efficiently to keep children and parents happy. Gingerbread House Contest - Spark people’s creativity and ignite their festive spirit by hosting a gingerbread house decorating contest at your venue or a nearby hotel. Have contestants pay an entry fee that benefits your nonprofit and charge guests to come view them. Create several award categories based on the judges’ decisions along with a people’s choice award (where guests pay to vote) and offer prizes. Consider serving hot cocoa to add a cozy element. Snowball Fight - Start an annual tradition in your town with a schoolwide or citywide snowball fight. You can set it for a specific age group and group entries by age. If your city doesn’t have natural snow available, you can rent a snow machine. Host it at a local park unless your venue has enough green space. Open a concession stand to raise funds and warm up those icy hands with a cup of hot cocoa! Gift Wrapping - A gift-wrapping fundraiser is a helpful service for busy people. 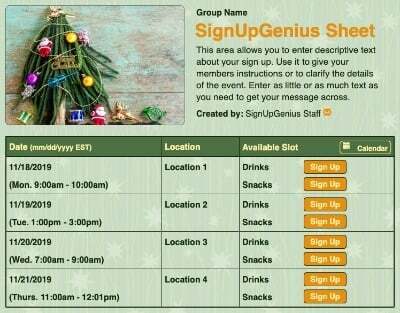 You can either hold it at your venue at a set time and offer cookies and cocoa for people to enjoy while their gifts are being wrapped, or you can partner with a group where you go to their office and extend the service over a lunch hour. You can also directly sell wrapping paper to people as your fundraiser. Rent-a-Student - Decorating for Christmas is fun, but pulling stuff out of the attic is not. What if you could rent a high school student to haul all your boxes down from the attic or carry them up from the basement? And contribute to a good cause at the same time? High schools and youth groups could advertise holiday prep services to their church and community and work in pairs for accountability and safety. Have the youth leader or teacher supervise. Cleaning - A clean house is a gift year-round, but especially before the holidays. Have your group advertise cleaning services for homes and businesses during December as a fundraiser and a helpful service to people. Have them work in groups of at least 2 or more for accountability, safety and efficiency. Make sure expectations are clear from both the cleaning crews and people investing in the services. Hanging Christmas Lights - Many people want to put up Christmas lights or outdoor décor, but don’t have the time or energy. Your group can provide a service that makes the magic happen. Window Art - Many businesses enjoy having their windows decorated at Christmastime. Offer window decorating services to local companies with a variety of themes: Thanksgiving, Winter, Hanukkah, Christmas and Kwanzaa. The key to a great holiday fundraiser is to try and sell goods or services that people will want to buy or that they need anyway. Make it festive and fun and everyone will enjoy the season! 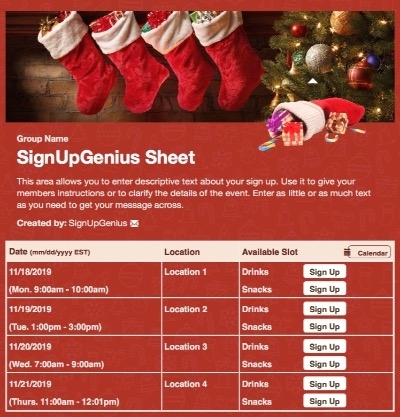 Simplify Christmas party RSVPs with an online sign up.